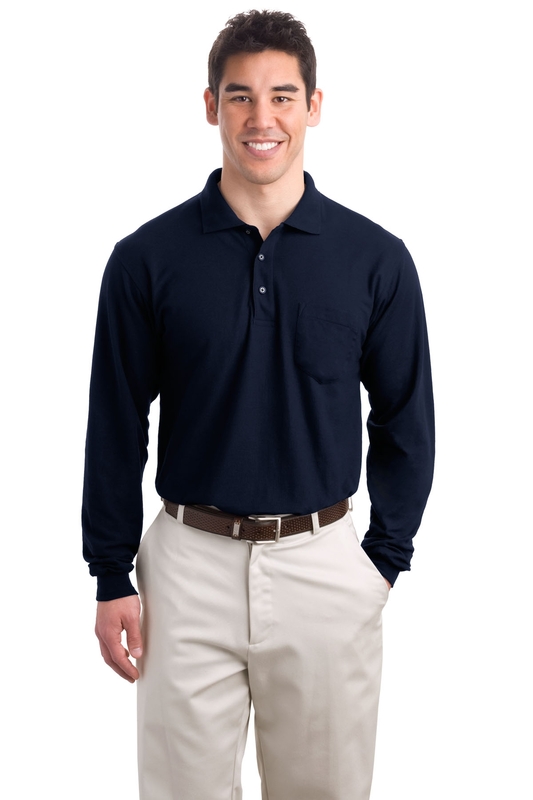 When one hears the word silk, one thinks of comfort and that is exactly what the Port Authority Long Sleeve Silk Touch Polo with Pocket offers. Silk screams comfort, class and above all else style. Emperors, Kings and Maharajas have worn silk in times gone by and now its time for you and your team to experience that comfort and get to the top of your game. From corporate outings to charity events and more, this stylish polo shirt will turn heads and get you and your brand noticed. Dress your entire team in this versatile shirt and ensure that everyone is comfortable, fashionable and distinguished in their appearance. The long sleeves, which this polo features, bring a lot of versatility to this garment. In warmer weather, the sleeves offer protection from the sun and if you become too warm they can easily be rolled up. On the other hand, if your group is experiencing colder weather, then you can take solace in knowing that your team will stay warm with the longer sleeves. This top can be tucked in for a more professional, together look or can be left hanging out if you are going for that more relaxed, laid back appearance. This polo is lighter to other typical styled polos at a mere 5 ounces. It’s constructed from 65% polyester and 35% cotton pique offering a fantastic level of comfort and durability. The Port Authority Long Sleeve Silk Touch Polo with Pocket proudly features a flat knit collar and cuffs to keep with the traditional appearance you might expect from a polo shirt. With metal buttons featuring a dyed to match plastic rims, it works extremely well with the soft, sleek silk material and gives the classic polo shirt a new modern twist. So, dare to be different, dare to be seen and try out this incredibly versatile and stylish polo shirt for your next group occasion. The Port Authority Long Sleeve Silk Touch Polo with Pocket also features a double-needle armhole seams and hem which gives it an unparalleled texture. Each of these shirts also features side vents to guarantee the most comfortable, breathable wearing experience you could possibly expect. And yes, the silk will feel amazing against your skin. There is a limited choice of colors, yet each color looks great in this design. The traditional colors include: Black, Navy and White. Adult sizes come in a varied choice from XS-4XL.